A look into Red Points’ research on fake designer clothes for sale online, as well as consumer opinion and shopping behavior. The danger that counterfeiting poses to designer clothing brands is unquestionable, and for brands - unignorable. Many will remember the hit Burberry took to its reputation and demand in the 2000s when widespread counterfeiting replaced with the brand’s association with A-list celebrities with “chavs”, negatively affecting the fashion house’s sales and brand value. In total, 81% of respondents would negatively change their buying behavior towards a brand they liked in reaction to seeing fakes online. 32% of participants would look for an alternative if they became aware of counterfeits of a brand online. 8% said they would outright stop buying from the brand if they were to find a counterfeit version of their product for sale. This comes as a somewhat surprising discovery, considering the previous research into personality traits and counterfeiting, which suggests that the prestige effects of cheap fake designer clothes offsets the desire to own authentic products. 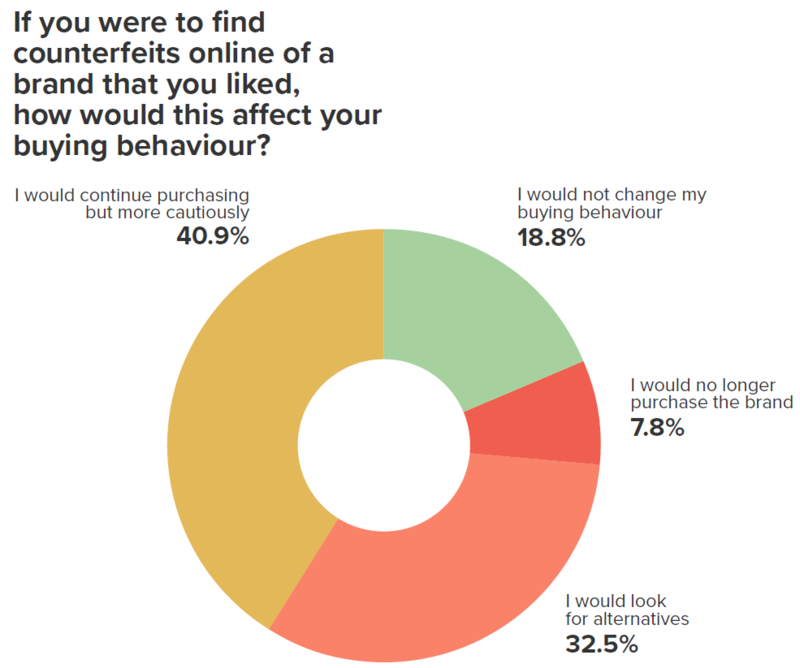 Research participants were asked how they would react to receiving a counterfeit item they’d bought from ecommerce, thinking the purchase was for an authentic good. Many consumers do show a sensible reaction to the situation, with the most common response being to request a refund from the ecommerce seller, with over 40% saying they’d submit a complaint to the platform. 48% would warn their friends and family about buying your products. 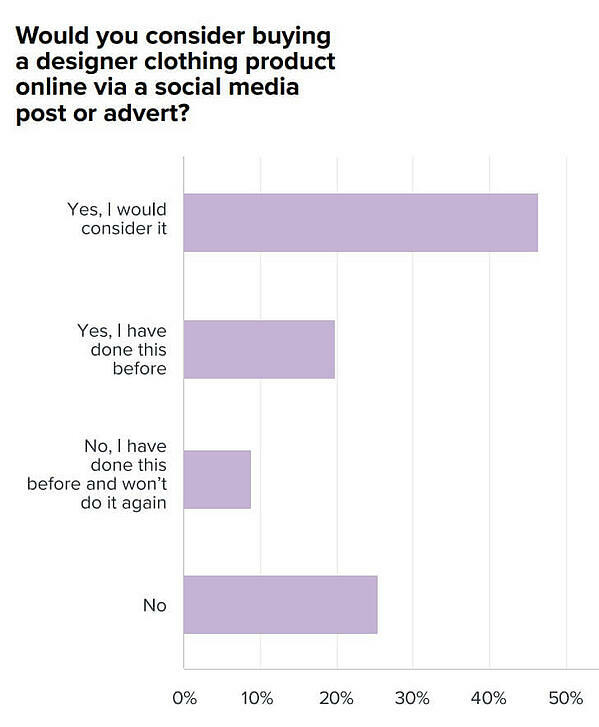 22% would complain publicly on social media. Both of these responses could have huge implications for brands. With nearly half of respondents saying they’d warn their friends and family. The power of word of mouth is no secret. If half of your customers that accidentally buy a fake start talking about your counterfeiting woes - and more than a fifth of them doing so publicly on social media - this is a problem that has the potential to snowball. People from all industries take part in shopping practices that put them at risk of accidentally buying counterfeits. This is especially true of customers in the designer fashion industry. 65% of consumers would at least consider purchasing designer clothing on social media. We’ve seen the growth of dangers to brands appearing on social media countless times, which is in large part due to the enormous potential customer base available to crooks, as well as privacy settings allowing counterfeiters to work in secret, and the anonymity of accounts that allows them to continually create new profiles. Not to mention Instagram’s apparent laid-back approach to allowing suspicious adverts on their platform. 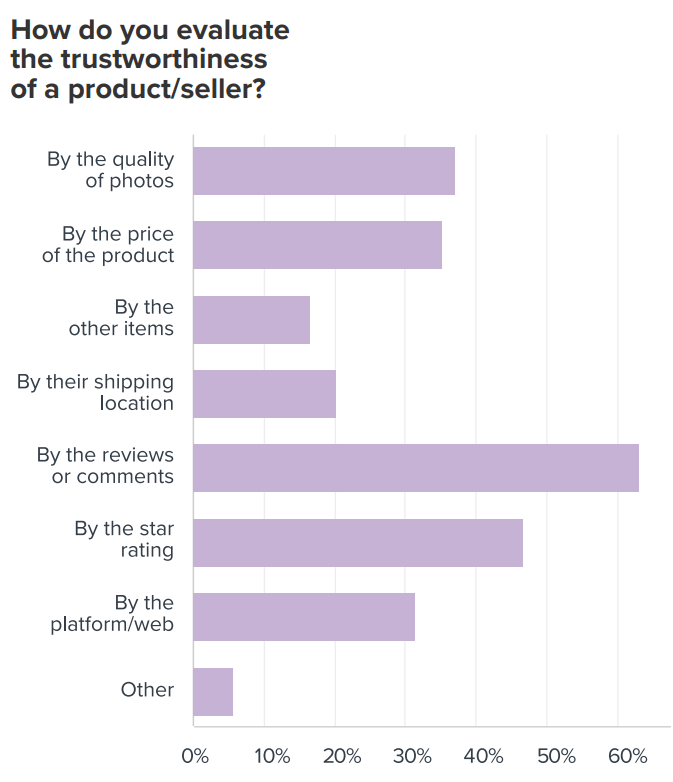 63% of consumers trust reviews and comments, 47% use star rating on the ecommerce listing. Despite product reviews and star ratings being the most commonly used factors for determining product authenticity, both of these have become unreliable methods in recent years. 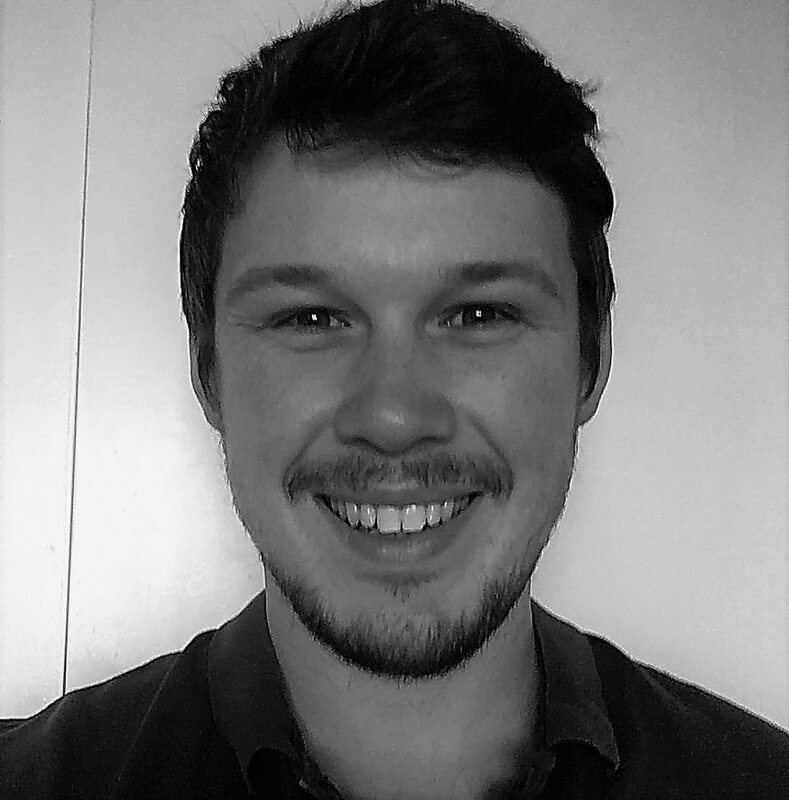 The expanding usage of bots online means that it’s easier than ever to generate huge amounts of fake reviews and to hugely influence star ratings on products - even on ones with a long history of satisfying customers. 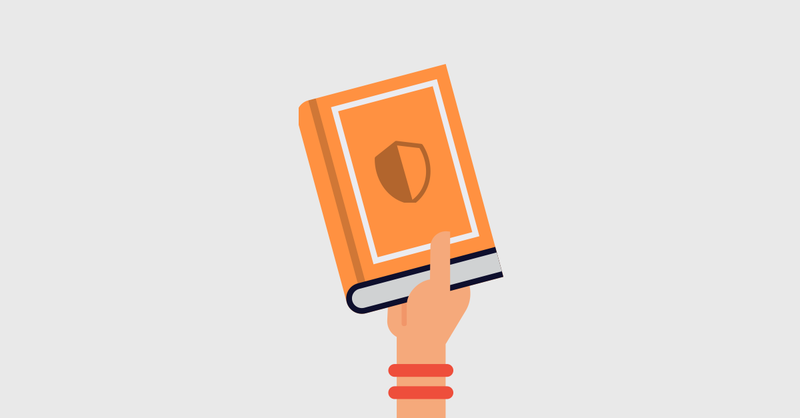 The factors which specialists working in brand protection use regularly, and would recommend to customers and brands, are greatly underused by online shoppers. Only 16% of consumers look at the other items the seller has in stock, while 20% check shipping location, and 35% use product price. Sellers of counterfeit products rarely have a full catalog of products, they instead tend to sell a small number of the highest selling products from a brand. Shipping location is useful since such a huge amount (80%) of the world’s counterfeits are manufactured in China, the nation is considered very high-risk to buy from online. Lastly, product price is an important potential signifier for fake goods. The old adage rings true for online deals: if it looks too good to be true, then it probably is. 66% of respondents claim to never have bought a fake product online. Less than 11% that bought the fake did so knowingly. Users’ search intent when shopping online also mirrors the findings above. 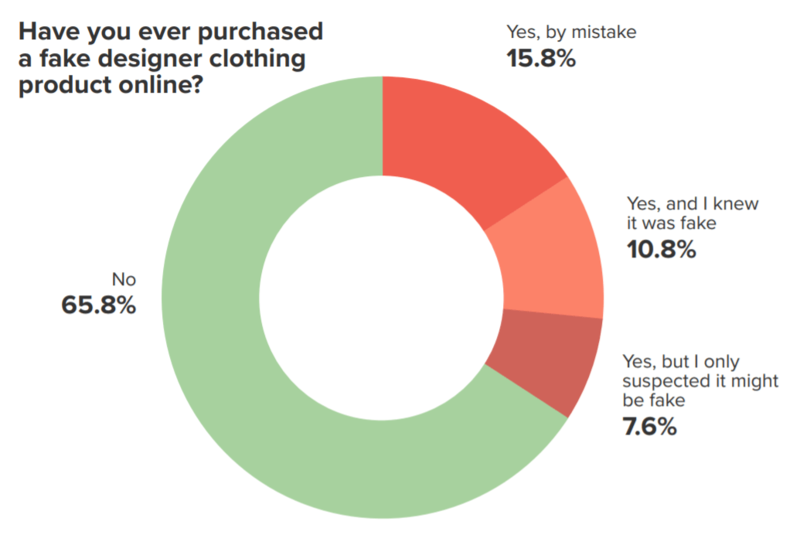 Only a small minority of respondents in Red Points’ research actually went online to look for designer fashion fakes. The clear majority were either looking to buy either an authentic product or an authentic product that looked similar, perhaps from a different brand. The vast majority of respondents, 88%, who had bought fakes were initially searching online for an authentic white market product. 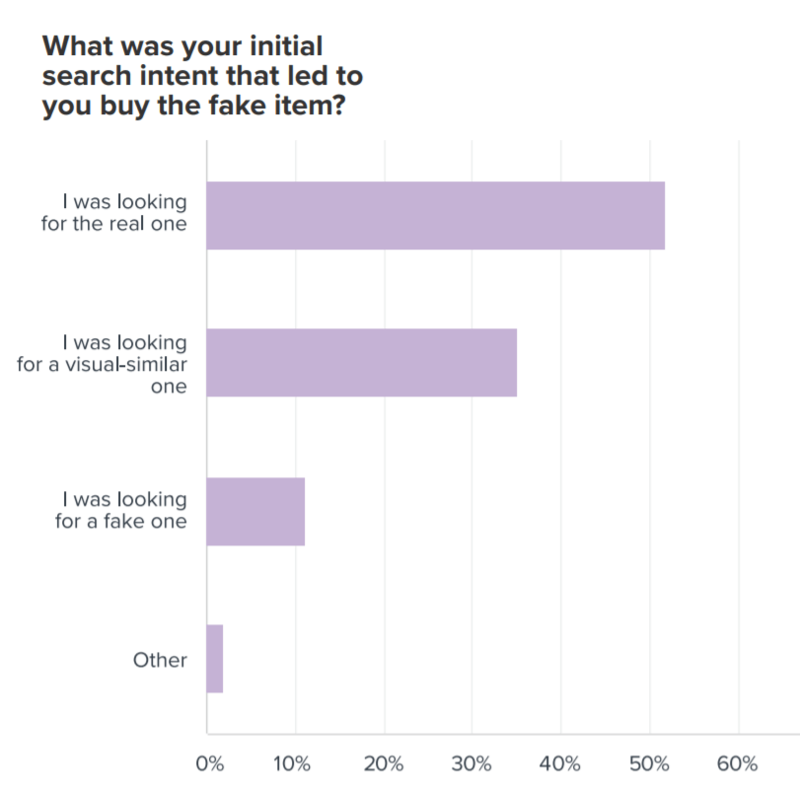 Only 11% actually went shopping online with the intention of looking for fakes. Though it’s clear that consumers of designer fashion products overwhelmingly do not seek out counterfeits online, the research shows that when people do receive a fake item, they are more satisfied with it than they may have previously expected. The results of this section should come as a huge red flag for brands. Out of all respondents who had bought a fake, 31% of them did so knowingly, while 67% were satisfied with the fake product they received. What this means in there is a considerable number of shoppers who are buying designer fashion fakes unintentionally, but are satisfied anyway. These findings may point to the improving ability of counterfeiters to make high-quality counterfeits, known as super fakes. Many modern counterfeits are no longer just cheaply made knock-offs with a logo slapped on the article. Production methods and tools are becoming more sophisticated and more affordable, meaning counterfeiters have a greater ability to make fake products that satisfy consumers - even those shoppers intending to buy an original, authentic item. Some clear implications can be found from this research. 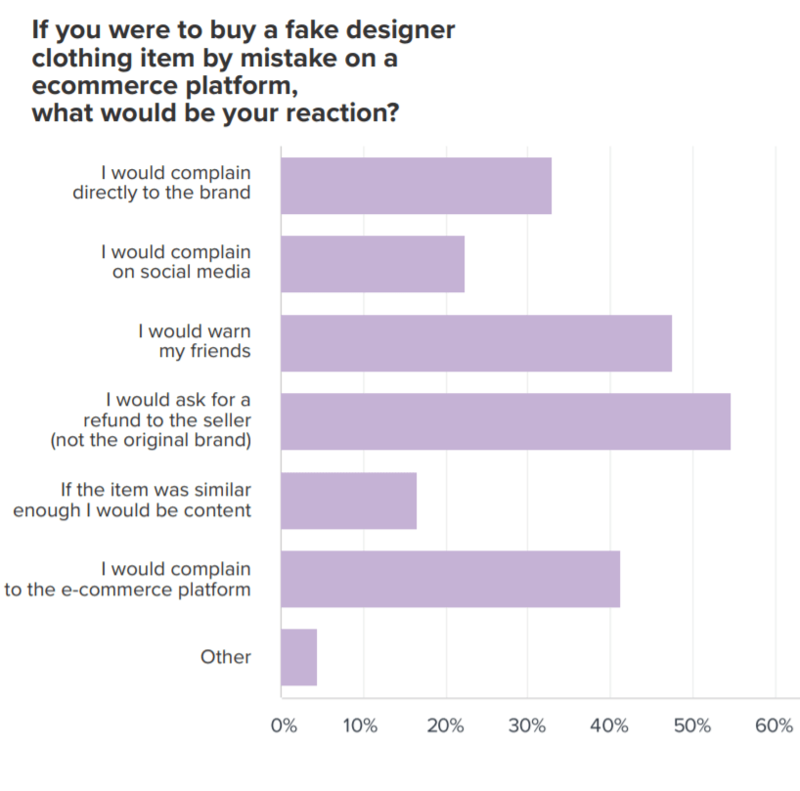 First off, the majority of designer fashion consumers are uninterested in buying fakes - so much so that even becoming aware of the presence of fake designer clothes can turn shoppers off from buying from a brand. However, those shoppers who have purchased a fake item by mistake have actually been quite satisfied with the fake item they received. Risky search habits and counterfeiters’ improving ability to sell online will get more well-meaning designer fashion fans buying fakes, and possibly allow them to see they can get the same satisfaction at a much lower price. At the end of the day, allowing counterfeiters to work freely is a deeply troublesome situation for brands. Those consumers who find fakes online, or purchase one by accident will either be satisfied with what they receive, and will be more inclined to buy fakes in the future, or they’ll be disappointed with the product, and see the brand as unreliable and a risk to buy from online.